This doll can close her eyes. 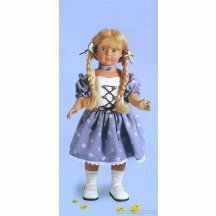 Schildkröt is the oldest manufacturer of dolls continuously producing dolls from 1896 till today. In the classic collection Schildkröt today produces replicas in a limited number of pieces. These dolls are duplicates of old models. Made out of Tortulone, a high-quality plastic material.